I decided its been way too long since I shared a recipe with you all! Down here in Arizona, the trees have been loaded with citrus and everyone I know is dying to give it away. We don't have any citrus trees (or really much landscaping at all), so we are the happy recipients of whatever fruit people throw our way. This week I've been in a lemon mood. 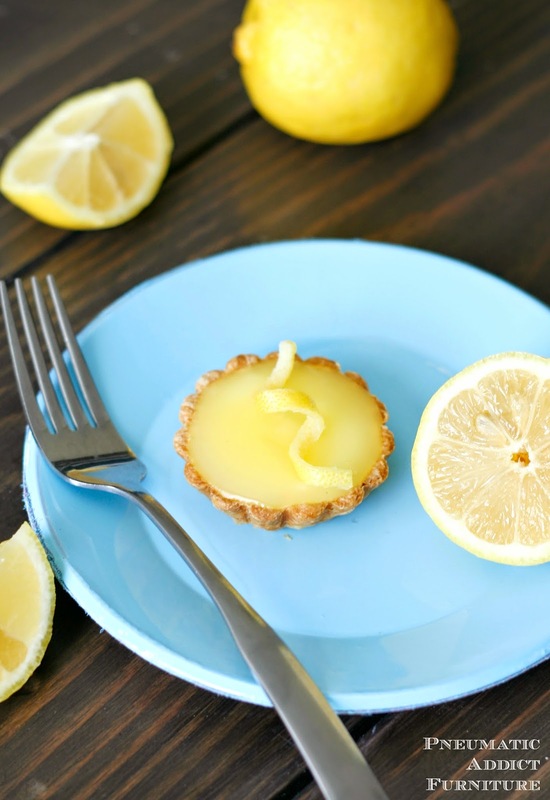 Doesn't lemon feel like a summer food? I don't know why, seeing how lemons are in season in winter, but I always think of summer when I think of lemons. So, if you live in the large percentage of the country which is covered in snow currently and long for sunny days, I've got the recipe to get you out of your winter state of mind. 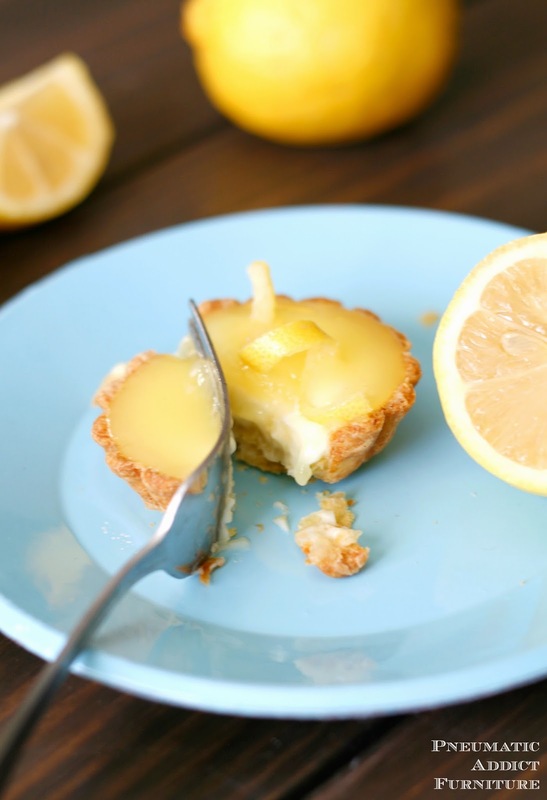 Double lemon tarts. They are so bright and refreshing! 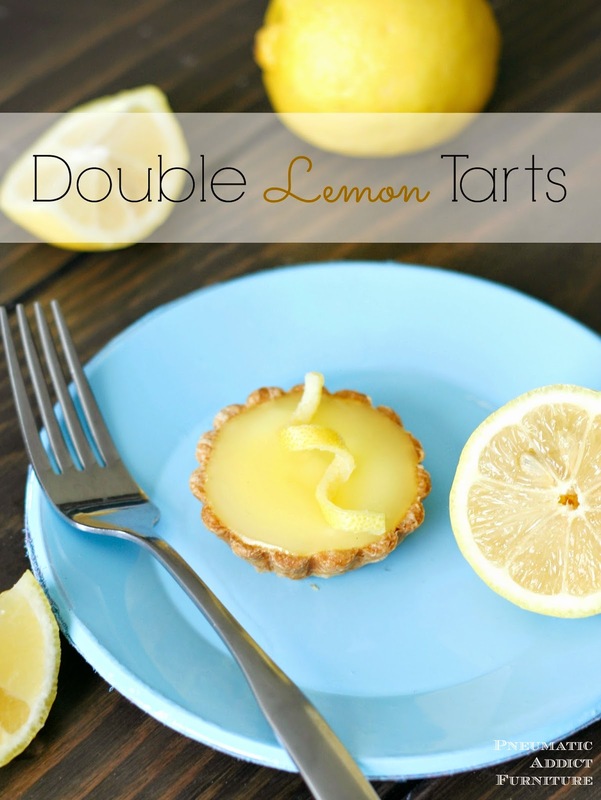 I called them "double lemon" because there are two layers of tart and sweet lemon fillings in this little treat. The first is a rich, lemon, sour cream custard, and the second is a tangy and light, lemon coulis Coulis is just a fancy word for "thick sauce" (thank you Master Chef Junior), and is actually really easy to make. But first, you have to make a crust. A pastry is only as good as it's crust, if you ask me, and this one is flakey, buttery, and fabulous. A tip if you decide to make mini tarts, like myself. 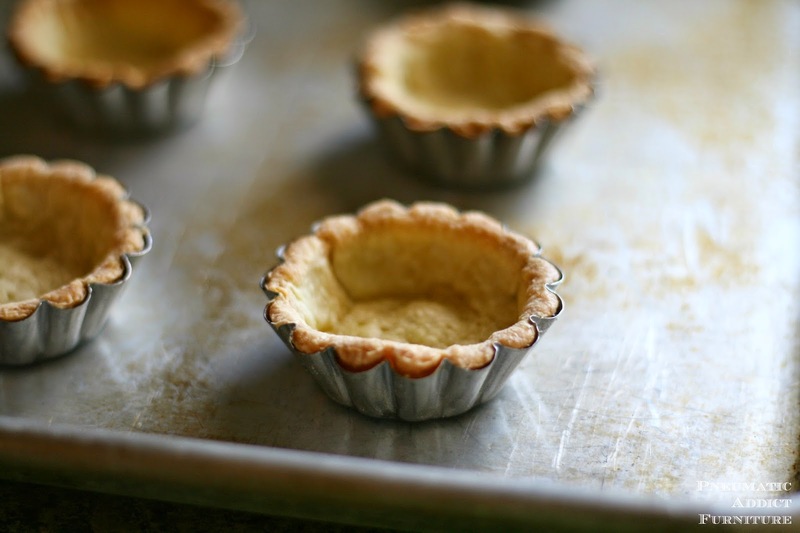 Use an extra large pastry bag to pipe the custard filling into the tart shells. You'll get a much more consistent amount and less mess. If the coulis is very thick, reheat it in the microwave for a few seconds until it thins a bit. Then, you can simply spoon it over the top of your custard. My husband says they "taste like lemonade". How could you go wrong? Sift the flour and powdered sugar into a large bowl. Dice butter into small cubes. Add butter to bowl and cut in until it resembles coarse sand. Add egg yolks and lightly start to mix together. Add water if needed, but be sure to not overwork the dough. Once dough just comes together, remove from bowl, flatten into a disc, cover in plastic wrap and refrigerate for 1 hour. Pre-heat oven to 375 degrees. Roll dough into a circle, approximately 1/8" thick. If making 10-inch tarts, drape one circle over each tart pan. 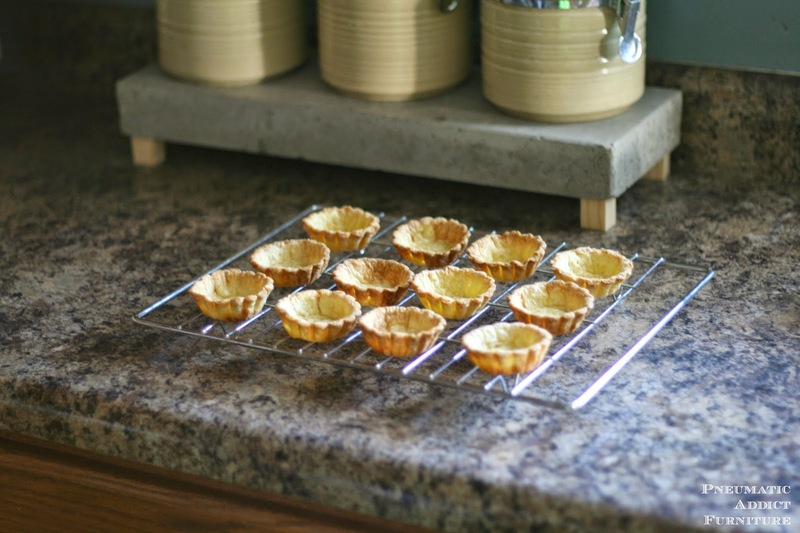 If making mini tarts, use a large cookie cutter to cut smaller circles. Press dough into the pan and prick with a fork. Line the dough with tin foil and weigh it down with rice or baking weights. Bake blind for 15 minutes, then remove the tin foil and rice. Return the shell to the oven and bake for another 10 minutes until crisp and lightly golden brown. While the pastry shell is cooling, place the sugar and cornstarch into a medium-sized saucepan. Add the zest of two lemons and juice of three lemons. Whisk in egg yolks, milk and water and blend into a smooth paste. Dice the butter into small cubes and add to the mixture. Place the saucepan over a medium heat and stir well until the sugar dissolves and the butter melts. Keep stirring and scrape the bottom of the saucepan to prevent the custard from burning. Bring the custard to a gentle boil and continue to stir. Once custard has gotten very thick, remove from heat. Pour the hot custard into a bowl and place plastic wrap directly onto the surface to prevent a skin forming. Allow to cool to room temperature. Add sour cream and whisk together until smooth. Pour into cooled pastry shells and refrigerate. To make the lemon coulis: Whisk together sugar and cornstarch in small saucepan. Add water and stir over medium heat until mixture boils and thickens. Add butter and stir until melted. Remove from heat. Whisk in lemon juice, lemon extract, and one drop of food coloring, if desired. Allow to cool to room temperature. 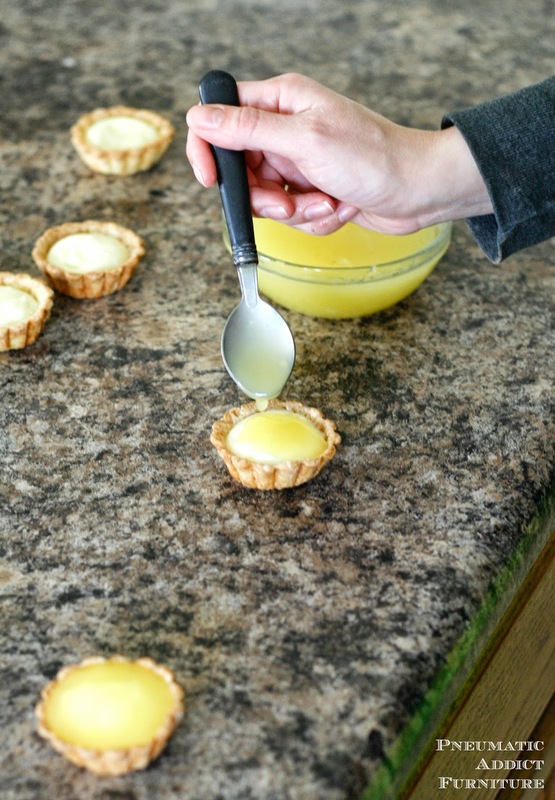 Pour coulis over custard layer, garnish if desired and refrigerate tarts for 4 hours. Serve chilled. 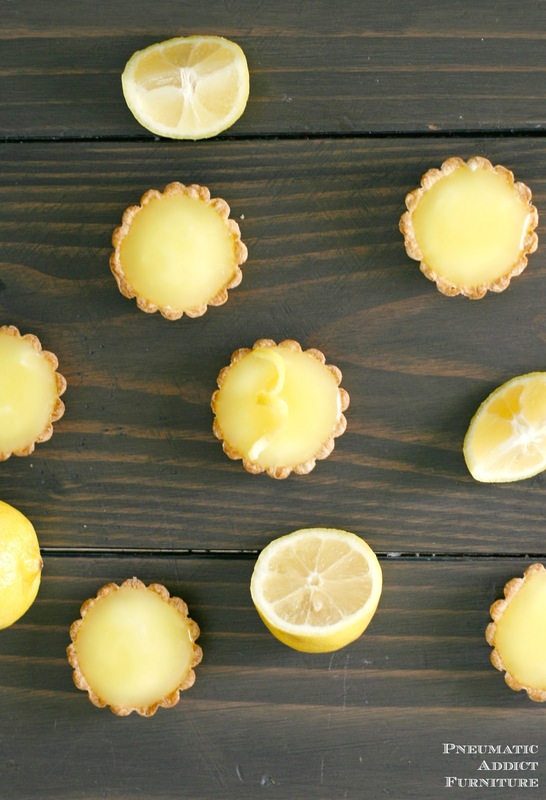 Your lemon tarts look divine! Love the bite sized portions...although I'd probably eat 10! You've got me drooling every time I run across this picture. They look so good!